This page is dedicated to Roberto Clemente. Roberto Clemente has always been my all time favorite major league baseball player. Plus, he is very popular with collectors. It's been 44 years since my sister broke the news to me about Roberto's death that New Years day, 1973. I was 14 years old. 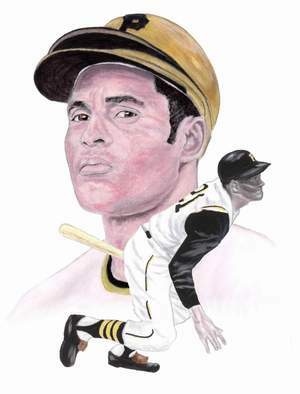 Here's another Roberto Clemente tribute that a friend of mine sent me. One of a kind hand painted Roberto Clemente bats. 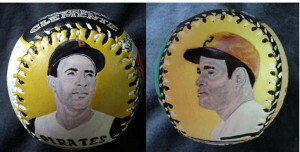 If you would like a hand painted Clemente baseball similar to any of the ones below, please let me know. Or I can create one completely different for you.